The big bang theory of the universe needs to invoke the existence of a hypothetical substance called cold dark matter. This is necessary in order for it to explain how galaxies were able to form out of rapidly expanding, smooth space after the initial explosion out of nothingness. Unfortunately, the calculations imply that most galaxies would have far more stars and dark matter at their cores than they actually do. The problem is most pronounced for dwarf galaxies, which are the commonest type. An international research team, led by a University of Washington (UW) astronomer, reports in Nature (Jan 14 2010) that it used millions of hours on supercomputers in order to find some way out of the problem. In the end, the simulations were able to produce dwarf galaxies similar to those in the real universe. "Most previous work included only a simple description of how and where stars formed within galaxies, or neglected star formation altogether," said Fabio Governato, a UW research associate professor of astronomy and lead author of the Nature paper. 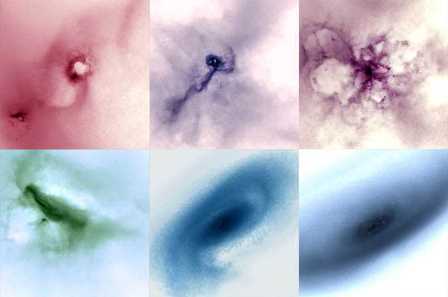 "Instead we performed new computer simulations, run over several national supercomputing facilities, and included a better description of where and how star formation happens in galaxies." The simulations showed that as the most massive new stars exploded as supernovas, the blasts generated enormous winds that swept huge amounts of gas away from the centre of what would become dwarf galaxies, preventing millions of new stars from forming. With so much mass suddenly removed from the centre of the galaxy, the pull of gravity on the dark matter there is diminished and the dark matter drifts away, Governato said. It is similar to what would happen if our sun suddenly disappeared and the loss of its gravitational pull allowed the Earth to drift off into space. By making these cosmic explosions big enough and frequent enough it was possible for the simulations to generate galaxies with substantially lower densities at their cores, closely matching the observed properties of dwarf galaxies. "The cold dark matter theory works amazingly well at telling where, when and how many galaxies should form," Governato said. "What we did was find a better description of processes that we know happen in the real universe, resulting in more accurate simulations." The theory of cold dark matter, first advanced in the mid 1980s, holds that the vast majority of the matter in the universe — as much as 75% — is made up of "dark" material that does not interact with electrons and protons and so cannot be observed. The term "cold" means that immediately following the big bang these dark matter particles have speeds far lower than the speed of light. In the cold dark matter theory, smaller structures form first, then they merge with each other to form more massive halos, and finally galaxies form within the halos. Coauthors of the Nature paper are Chris Brook of the Jeremiah Horrocks Institute in the United Kingdom; Lucio Mayer of the Institut für Astronomie and the Institute for Theoretical Physics in Switzerland; Alyson Brooks of the California Institute of Technology; George Rhee of the University of Nevada; James Wadsley and Gregory Stinson of McMaster University in Canada; Patrik Jonsson and Piero Madau of the University of California, Santa Cruz; Beth Willman of Haverford College in Pennsylvania and Thomas R. Quinn of the UW. The research was funded by NASA and the National Science Foundation, and was conducted using facilities of NASA's Advanced Supercomputing Division, the University of Washington Computing Center, the Arctic Region Supercomputing Center in Alaska and the TeraGrid supercomputer coordinated through the Grid Infrastructure Group at the University of Chicago.